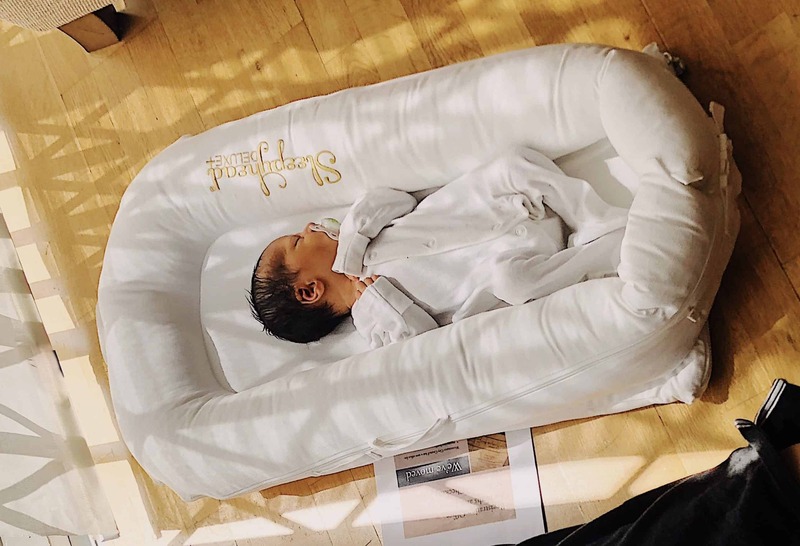 Being the eldest or the youngest child has its perks: You are the most loved in the household, you get away with everything and anything, and everyone listens to you and what you want is what you get. However, there is always a downside and I’m afraid to say that being the youngest means being harassed and bullied on a daily basis. Meanwhile, being the eldest child means having to be generous and dig deep down into your pockets to pay for all the younger siblings. Luckily, I’m the youngest and brother B is the eldest, and when he wants to go for dinner, it means I don’t have to take out a single penny. Lucky me! Brother B wanted to celebrate his coming-of-age in style – no kebab or curry houses for him today! All my restaurant ideas were dismissed and he took matters into his own hands to choose this special place. Feeling the age, he wanted somewhere cool, smooth and slick to experience the blast from the past. Where would he find that special restaurant to check the boxes? Mayfair. 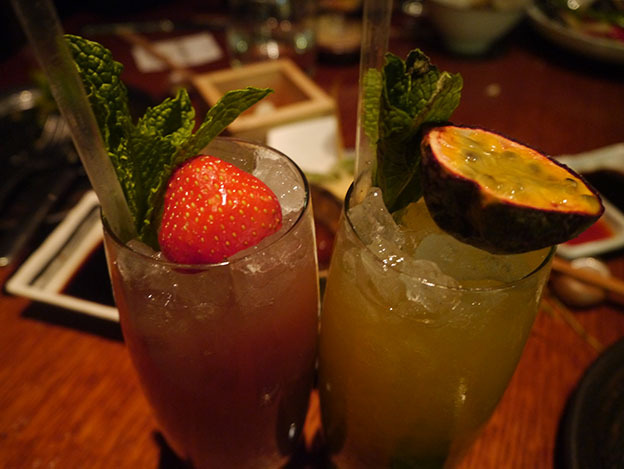 Yes, brother B chose his favourite restaurant, Novikov, in one of London’s most expensive locations! The rest of us siblings breathed a big sigh of relief knowing that despite of it being his birthday, brother B would be the one covering the heart-damaging costs. But just in case, I ‘forgot’ my wallet at home, phew. Arriving at Novikov, everyone was tall, tanned and beautiful. Feeling podgy and short, we headed straight to the bar reception area in which we ordered delicious virgin coladas and mojitos. 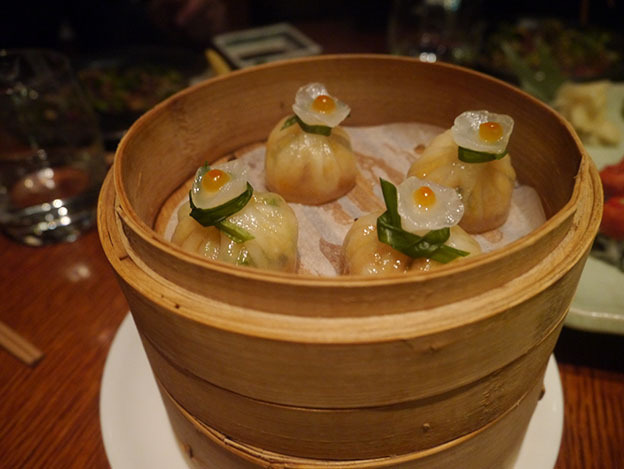 Novikov has two rooms in the restaurant; one that serves Asian and the other serving Italian food. Turns out, B had booked us into the Asian room and already knew what he had wanted to order, so without looking at the menu we left it to him and waited to be impressed. Boy was I impressed! 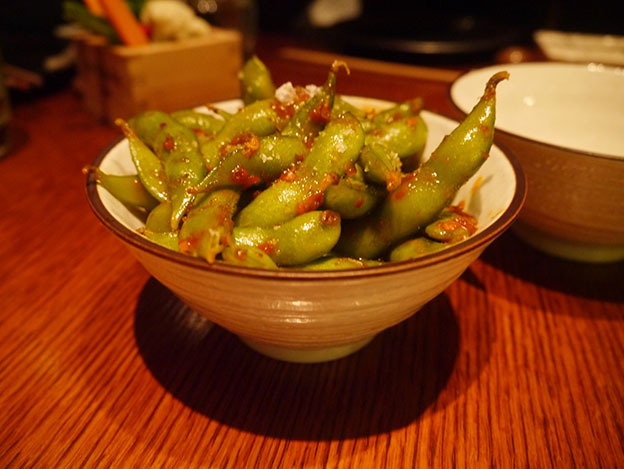 For those who are unaware of what edamame is: they are pods which consist of soft soybeans. The outside is inedible so you use your teeth to remove the beans form inside. These arrived hot, but instead of the usual sea salt, they were covered in a salty chilli sauce that wasn’t too overbearing. The waitress brought a mountainful of salad to the table in which she proceeded to shred the warm crispy duck. 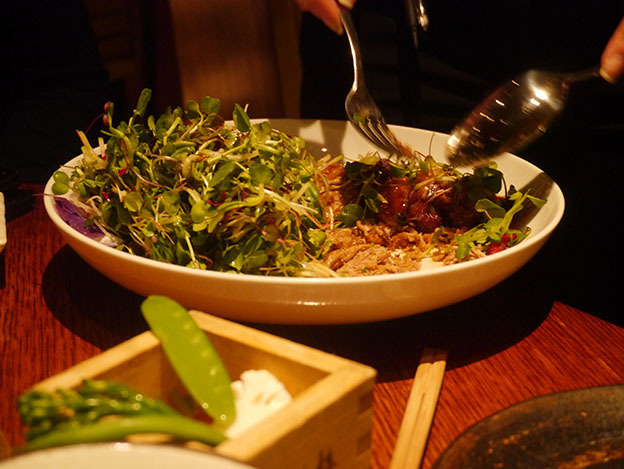 Once mixed, she placed a mass of leaves on each of our plates which had been tossed around with sweet crunchy pomegranate seeds, yuzu dressing and tasty peking duck. 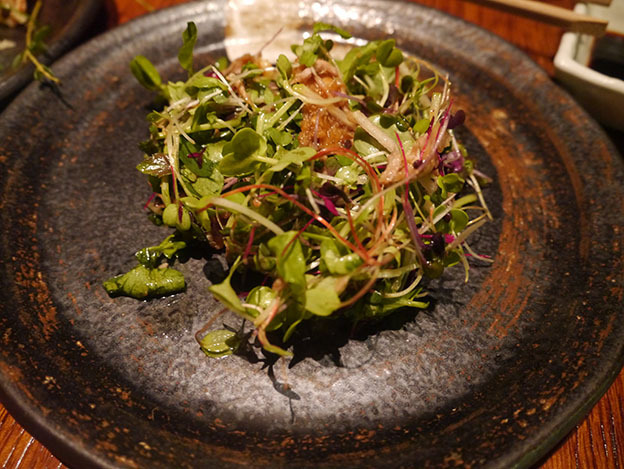 This is known to be one of Novikov’s signature dishes and evidently so, as various tables around us had the same masses of salad delivered to them. These red dumplings consisted of sweet shreds of black cod that had been soaked in miso for 24 hours. This helped the fish really capture the flavour of miso and the underlying coriander in the parcel allowed a balance for the meaty fish to really stand out. 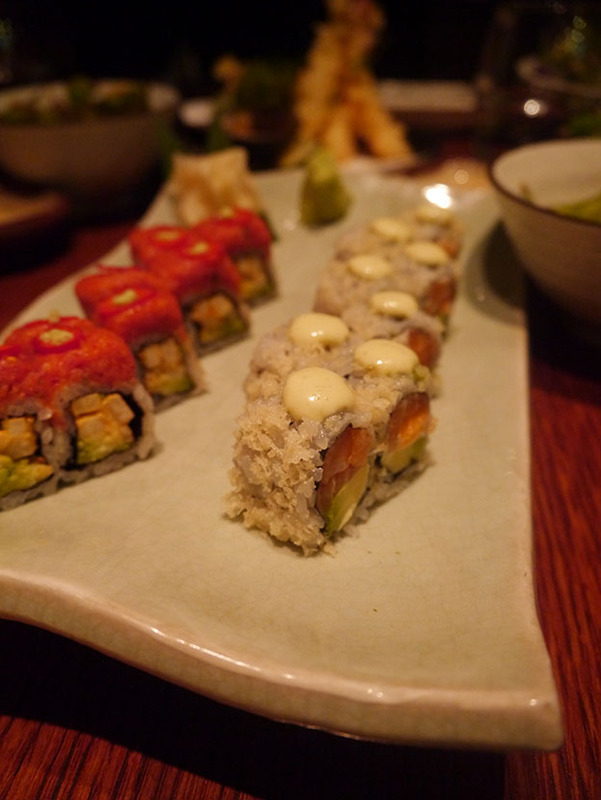 On the left is the spicy tuna and on the right is the salmon avocado maki. They arrived small and bite sized preventing the diner from filling themselves up too much on the sushi before the bigger dishes arrived. My favourite out of the two was the salmon avocado maki – fresh chunks of salmon were mixed together well with creamy avocado slices, then rolled up into rice and topped off with a wasabi paste. Whilst the taste of the salmon fish was more prevalent in the salmon avocado makis, I was unable to taste the tuna and only managed to sample the slightly spicy sauce. 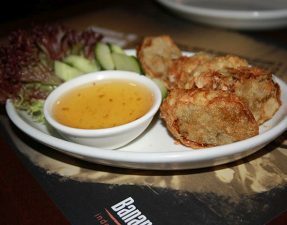 Monstrous fresh prawns were fried to achieve a thin crispy batter on the outside. 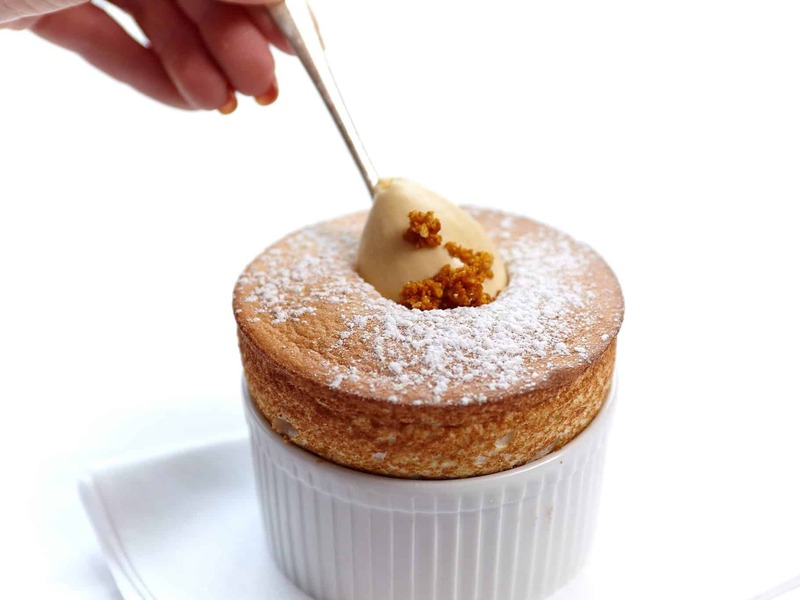 The crispiness had been perfected, but to me, it was not a dish that stood out from the rest. These cutlets came fat, juicy and delicious. The meat was tender and bursting with flavour with every bite. And how could I forget about the fat? Oh the fat… it was trimmed and so soft that it instantly melted in my mouth. Delicious! As you all know because I have mentioned it many times before, I am never one to say no to a good hunk of meat. We ordered two portions and asked for it to be cooked to a healthy shade of pink – in other words, medium. 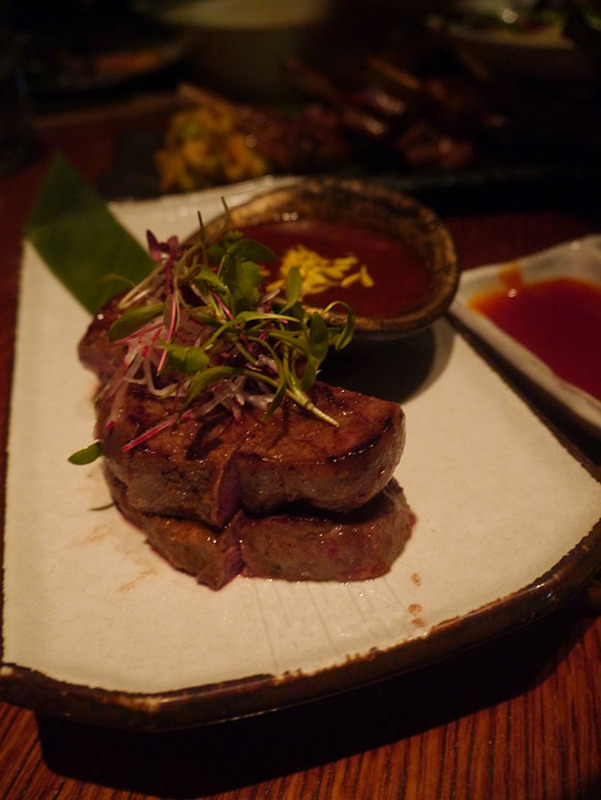 Fillet is known to be the softest and most buttery of all cuts of meat and Novikov did not fail to deliver. The additional flavouring from the chilli, ginger and garlic allowed the taste of the beef to really stand out without being too intense. We followed all of the above with a portion of vegetarian Singapore noodles and mixed vegetables. Simple and standard, but perfect with dishes that had immense flavour. Of course given that this meal was somewhat comp’ed by B, we just couldn’t resist looking at the dessert menu. Despite the fact that we were in the Asian room, B ordered a traditional Italian dessert. A cannoli is a fried pastry tube stuffed with delicious, sweet but cheesy ricotta. 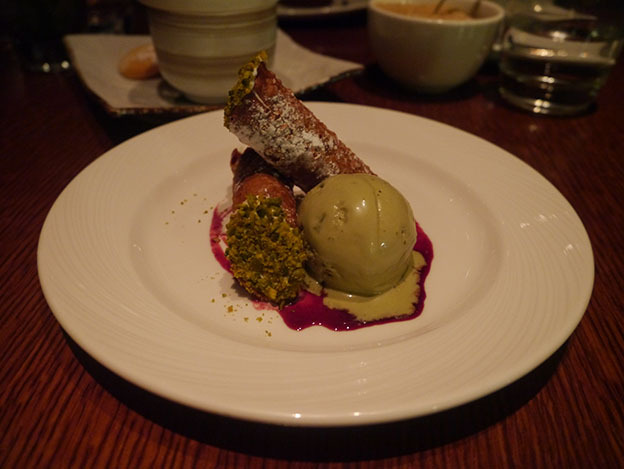 The ends were then dipped into crushed pistachios and served with a pistachio ice cream. Making cheese into a dessert is an absolute positive in my books and I scraped this plate clean! 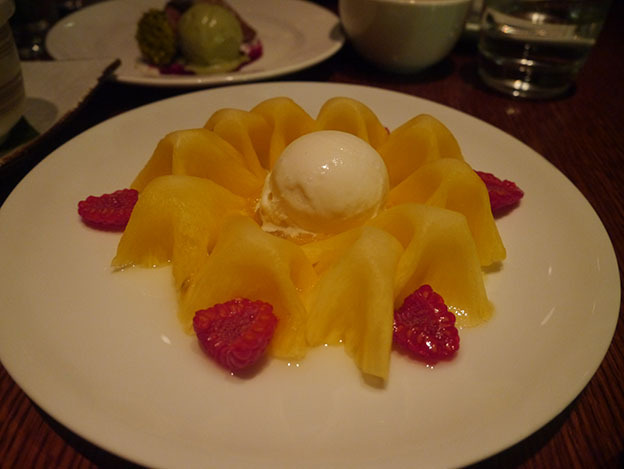 Thin sweet slices of pineapple came served with a healthy dollop of fresh creamy coconut ice cream. Look at this bad boy flow! Hands down, this was the best dessert of the night. 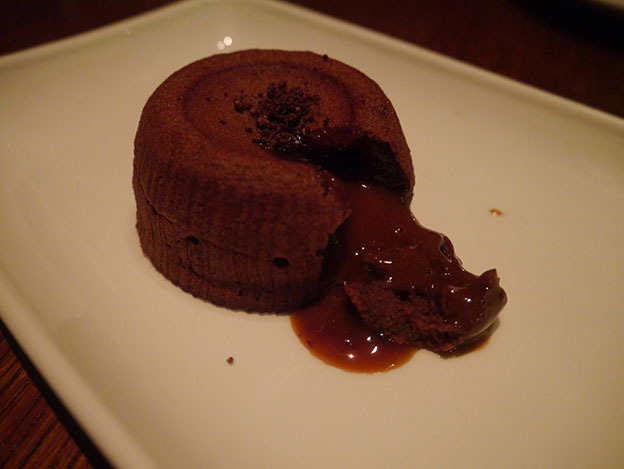 Soft chocolate cake filled with oozing chocolate sauce – how can one resist? The cake itself was rich yet light enough to be enjoyed without the accompanying vanilla ice cream. We left the Glamazon absolutely stuffed, some trouser buttons undone, and one of us with a big hole in his credit card. The total bill amounted to around £360 for five of us, which is considered to be relatively cheap going by Novikov’s location and standards. Some of you must be thinking how could you not think this to be even the slightest bit expensive? 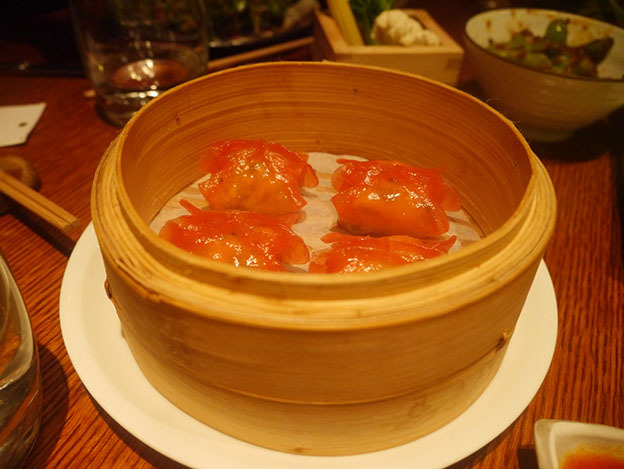 Well, with Novikov’s fresh food, attentive service and flashy atmosphere, the establishment is hard to default. This is the best Pan-Asian restaurant I have visited as of yet. With the menu being filled with a variety of dishes, it is not hard to find something to satisfy either your Japanese/Chinese/Thai cravings. 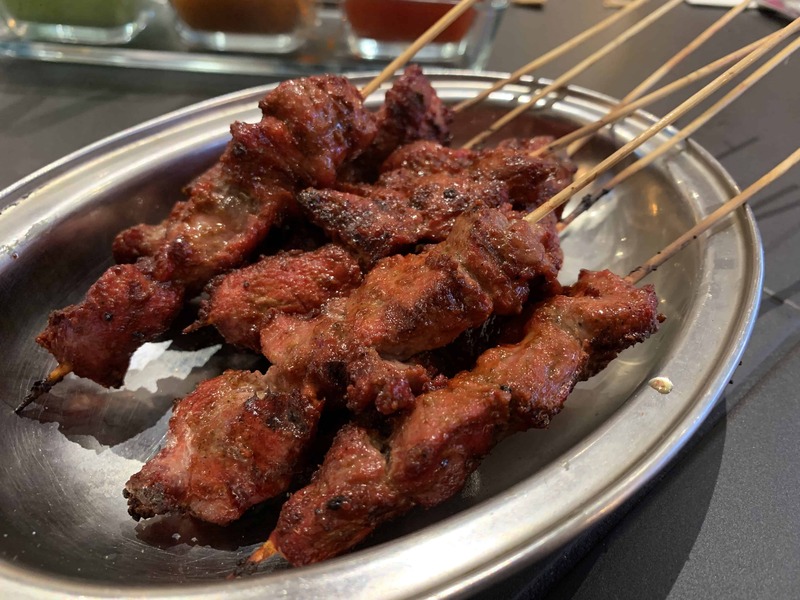 The best bit is that all the meats used in the Asian room of the restaurant is halal which makes it a lot easier for us Halalarians to sample all different dishes and also allows for us to experiment with restaurants that we had previously thought weren’t available to us. 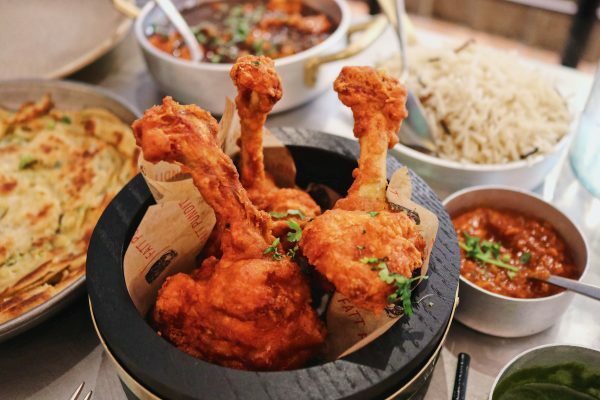 Despite them not advertising their halal status, a simple email to Novikov will allow you the necessary verification on their meats and for those that are interested in the Italian room, the chicken and lamb is also halal. 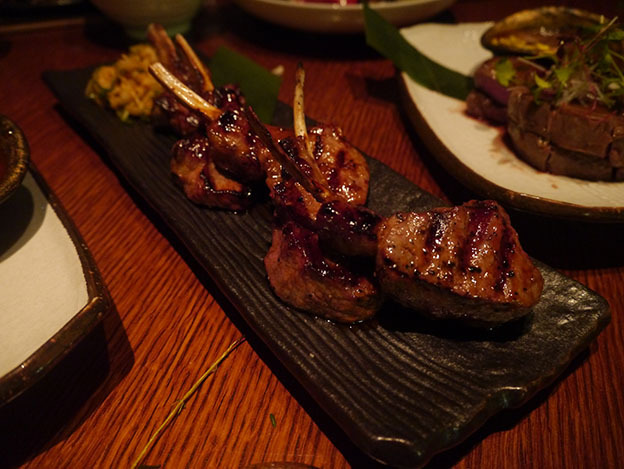 Halal status verified by Asian room of Novikov on all meats and by Italian room of Novikov on chicken and lamb. – Halal status on beef, lamb, and chicken verified by restaurant. 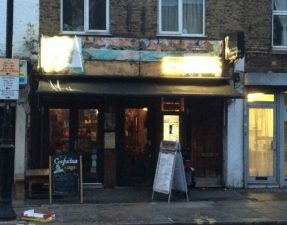 The duck is no longer halal since this review. That cannoli! Thanks for this fab post. Teriyaki usually has some form of alcohol in it (either mirin or saki, can’t remember)-did this one not have any alcohol at all? I actually had no idea that teriyaki had any form of alcohol in it. Thanks for the clarification and I have now removed the relevant section! 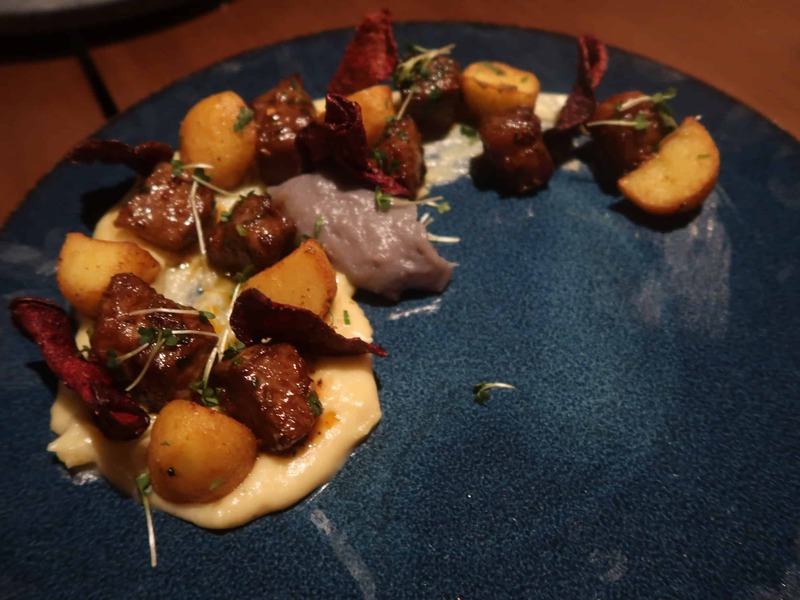 BTW – you tried Zuma in dubai – why not try the one here? Not halal but worth it for the sushi! Hi, thanks to your recommendation I visited this last week. Spent loads but it was worth every penny. So glad the food is halal, he and I had a great time and can’t wait to go back. 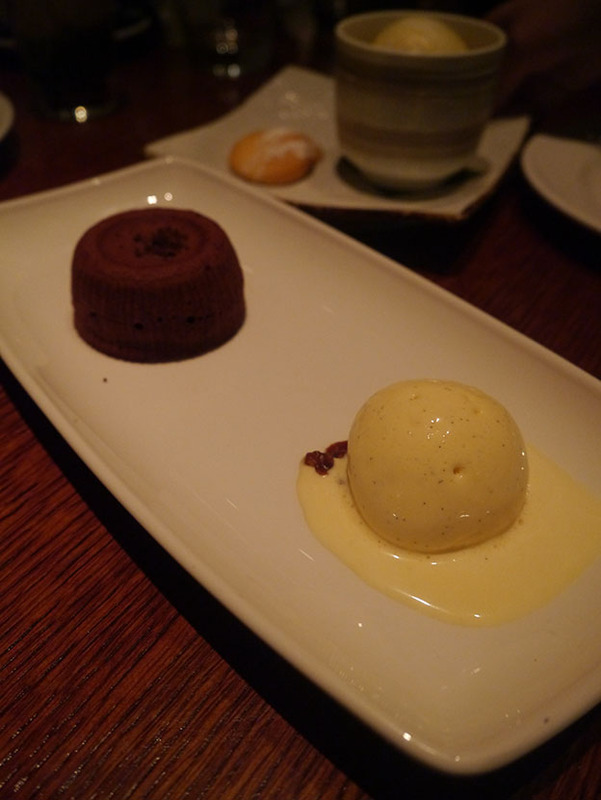 Can’t recommend the choc dessert enough! Love oriental cuisine! Please provide more reviews of Japanese/ Chinese and Thai places thanks! Anywhere in London where I can find a good halal Korean hot pot? 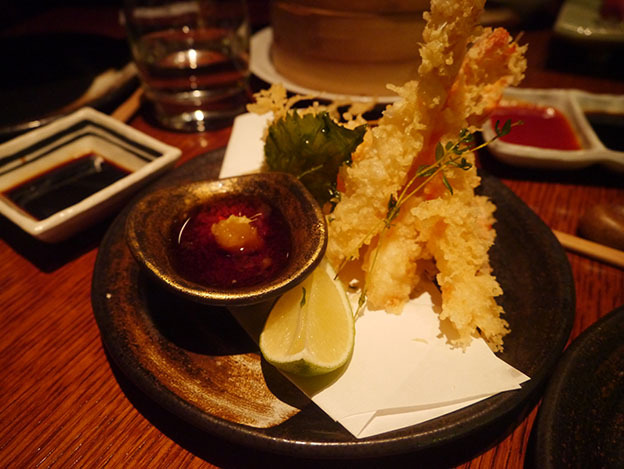 Off to novikov and nobu tonight, so a quick check on this post is just making me even more excited! I visited last week due to your recommendation. We took some guests from overseas. The restaurant was a huge hit. All of the food was outstanding and the ambience perfect. Thank you! 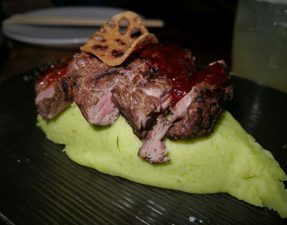 Is Everhing halal in novikov both Asian and Italian ? ?